What is the AI Strategy of your Firm? There is a new intelligence in town, and it is not made up of grey matter, neurons, synapses and signal substances. It is Artificial Intelligence, unbound by the limitations of the human brain and therefore, in time, capable of disrupting every intelligence-based creation. Including your company. Our intention here is not to be fear mongers, we simply want to point this out as a fact, and make sure that you are ready for the challenges and opportunities that AI presents. We also want to make sure that all business executives and firms are aware of the fact that they too will be deeply affected by this new form of intelligence. There are no exceptions. None. Corporate strategy has evolved immensely in the past 30 years, and is now better understood than when the term first became a buzzword. Most larger businesses recognise the importance of a solid corporate strategy, and are aware of its property as a constantly evolving governance tool. For the past 10 years, a holistic digital strategy has also been a key tool for organisations to focus and employ their resources to gain competitive advantage. The time has now come to gather the executive management team, take a deep breath, and ask the question: “What is the AI strategy of our firm”? 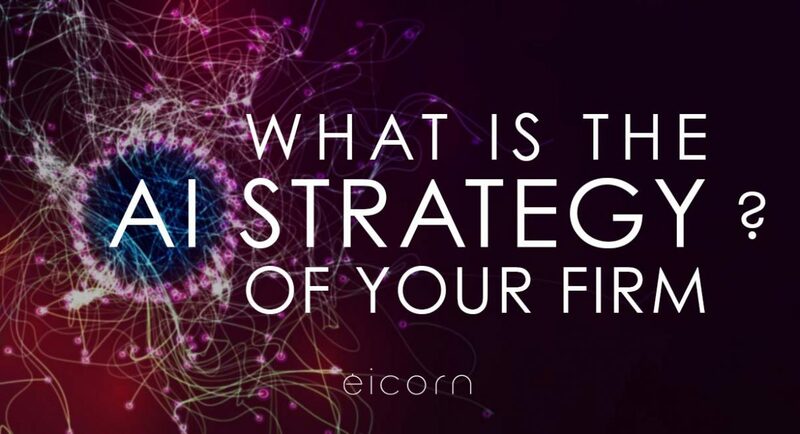 Eicorn has unique expertise in developing the strategic business value of Artificial Intelligence in large and small organisations. Intelligence as a valuable resource and a proprietary capability is present in every corner of every organisation, but understanding where to start introducing Artificial Intelligence for positive business impact is not an easy task. Many firms struggle to understand how to securely and efficiently develop and implement their first Artificial Intelligence initiative, and a corporate AI Strategy is instrumental to getting it right. In addition to AI business experience, we bring broad technical expertise to support executive management teams in their development of a Strategy for Artificial Intelligence. Our experts can provide essential guidance on the opportunities and threats that AI presents to your firm and industry, or take full responsibility for the development of an AI strategy. We can assess the intelligence density of your company, identify gaps, analyse weak and strong positions, and evaluate the risks and opportunities for short to long-term disruption or changes in market leadership due to AI. 1. Insight, the capabilities of your own firm. 2. Cross-sight, how the world in which you operate works. 3. Foresight, how the world will develop and how it may affect your company. The development of Artificial Intelligences demands an understanding of its approaching exponential effects: That it will completely disrupt the current balance between these 3 pillars. The race for competitive advantage by AI has begun, in every industry, and the winner – or winners – will use Foresight to build AI that abolishes traditional corporate capabilities and completely changes how the world works. AI is, from this perspective, simply an amplifier of both risk and opportunity in all industries, since it can multiply the intelligence density and leverage of firms far beyond human capabilities. This calls for a new strategic agenda in the vast majority of firms, and especially in larger companies. However, it is crucial that the AI strategy of any firm should align with its over-arching corporate, innovation and the increasingly common digitalisation (or simply digital) strategy. This is our key focus for every AI strategy development project we execute for our clients. Last but not least: You may have heard us in the past talking about buzz-words and short-lived fashions concerning innovation practices and management, saying “Don’t Believe the Hype”. Our message when it comes to the current development of Artificial Intelligence is the complete opposite: Believe the hype! AI is not a fad that will blow over, not a trendy add-on, not a bubble that will deflate. It marks the beginning of a new societal and industrial revolution that, unfortunately, will leave unprepared organisations behind. Let us help you to form a winning AI Strategy to become a leader in these new exciting times! Let us help you develop a Corporate AI Strategy!